A healthy and simple snack for kids. 1. Heat little ghee in a pan. 2. Fry the cashew nuts and remove. 3. Combine the peanuts, sesame seeds, roasted gram and rusk. 5. Add jaggery and grind again once. 6. Add dates, cashew nuts, raisins, tutti frutti and mix well. 7. Add little ghee if the mixture is too dry. 8. Make small/medium balls and keep aside them aside. Tip: If desired, sprinkle a bit of powdered sugar on top. 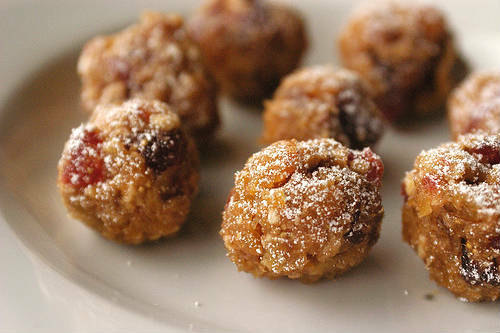 Feel free to comment or share your thoughts on this Mixed Nuts Balls Recipe from Awesome Cuisine.